Much has been written about the food at Murray’s, but few articles have focused on the exterior of the building that houses the iconic restaurant. Behind the aquamarine front at 26 South 6th Street South stands one of the oldest buildings in Downtown Minneapolis. This narrow (44 foot wide), three-story building was built in the 1880s, the same decade as the Lumber Exchange Building at 5th and Hennepin (1886) and the Masonic Temple at 6th and Hennepin (1888). The Murray’s building originally had a rugged masonry appearance. The first floor had two entrances; one for the first floor tenant and another for the upper tenant. The second and third floors had three bay windows on each floor. Above this were half moon windows vertically aligned with the windows below. The building was completed with partial, ornate parapets that increased its stature. 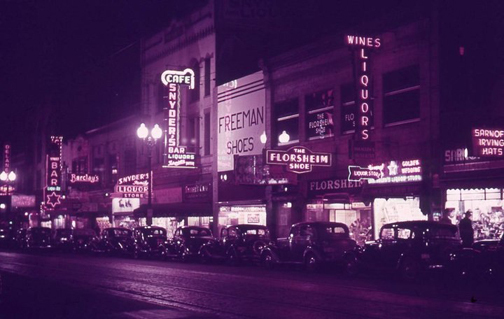 As with many Downtown Minneapolis storefronts of the late 19th and early 20th centuries, the Murray family choose to modernize the building exterior when they took over ownership in 1946. At that time, popular opinion deemed the existing storefronts cluttered and dingy. The taste had changed to a preference for flashy, sleek, and smooth surfaces. From the 1920s through the 1960s, restaurants and retail storefronts throughout the country updated to an Art Deco or Streamline Moderne style. Downtown Minneapolis was no exception as can be seen by these examples. The exterior style of Murray’s can be divided into two time periods: 1946-1953 and 1954 to the present. Prior to 1954, the Streamline Moderne decorations only extended to the storefront, and the 19th century second and third floor brick and window openings were visible. During this time period, Murray’s added stone and metal square panels to the first floor, a round-edged serpentine canopy, the neon sign that sits on top and the “Murray’s Restaurant Cocktail Lounge” sign. In addition, the Streamline Moderne horizontal lines underneath the sign and the vertical elements on the eastern portion of the building were installed to help give the building a feeling that airstreams could move smoothly over them. A large aquamarine blade sign also appeared, with “Dine/Dance/Cocktail Lounge” at the top, “Steaks Good Food” at the bottom, and Murray’s spelled out vertically in large letters in between. The sign’s size helped compete for attention with the other projecting signs on 6th Street and was used in Murray’s print advertisements. In 1954, Murray’s restaurant went bigger and bolder with their exterior signage while retaining most of the signage and exterior elements that had been built up to that point. The previous year, Murray’s received the Maurice C. Dreicer Silver Butter Knife Award for serving excellent steaks, and new signage was added to help promote this award. As part of the exterior remodel, the aquamarine panels were applied to the rest of the building and the parapets removed to create a smooth appearance from top to bottom. 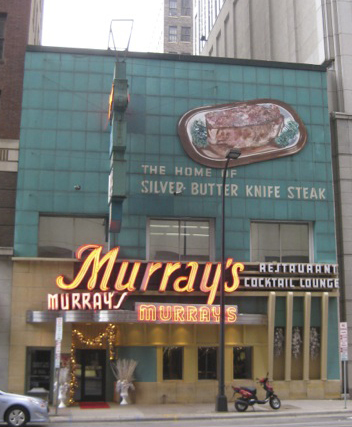 This new surface provided the perfect canvas on which to plaster a larger-than-life mockup of the Silver Butter Knife Steak and to proclaim Murray’s “The Home of the Silver Butter Knife Steak.” The former aquamarine blade sign was replaced with the blade sign we see today, which reads “Murray’s” in neon at the top, “Dine/Dance” in the middle on one side and “Cocktail Lounge” on the other. The bottom of the projecting sign contains an image of the Silver Butter Knife Steak accompanied by a bottle of Grand Vin de Chateau LaTour. The Murrays, aware that their award-winning steak deserved a worthy companion, chose a premier wine to accompany the entrée. Chateau Latour, made in Bordeaux, France, is considered one of the top five wines produced in the region. In 2011, a six liter bottle from 1961 sold for £135,000 at Christie’s auction house. A 750 ml bottle from 1954 today sells for approximately $2,100. What could be considered the deal of the century, in a 2004 episode of The Simpsons, the neighborhood bartender Moe served two glasses of an 1886 vintage to Homer and Marge Simpson for $4. In 1984, two additional changes took place. A large neon sign was attached to the canopy and three window openings were created within the first floor. For almost 60 years, Murray’s has been widely known as “The Home of the Silver Butter Knife Steak.” The distinction comes from an award given to the restaurant by Maurice C. Dreicer in 1953. Dreicer, a food and wine columnist, gave Silver and Gold Butter Knife Awards to restaurants he felt served a fine steak. He had many criteria for determining merit, but his ultimate test came with the first cut. A great steak, he wrote, “should be so tender that it can be cut with a silver butter knife.” The Murray’s steak that passed Dreicer’s rigorous scrutiny to earn the Silver Butter Knife distinction was the 28-ounce strip sirloin meant to serve two people. Dreicer began his search for the perfect steak in 1942. Over the next 40 years, he traveled to 60 countries and ate at thousands of restaurants. He, however, never found the Platonic steak ideal he sought and abandoned plans to publish a book on his research. Dreicer was described by the ABC television network as “the foremost gourmet of our time.” Mockingly, he was also called a “ self-appointed Pulitzer Prize Committee of One in the nourishment field” by Maurice Zolotow in his 1952 book, It Takes All Kinds. Embracing his inner opportunist, Dreicer turned Zolotow’s jab into a compliment, using it as a selling point on the jacket of a book Dreicer would later write on another topic. Shortly after receiving the Silver Butter Knife Award, Murray’s promoted this recognition heavily in print publications with an image of the steak that resembles the mock up on the outside of their building . According to an article in the magazine, American Restaurant, the award was “The spring board for vigorous promotion of Murray’s as one of the nation’s leading steak houses.” The combination of the high quality food and impressive advertisement was successful for Murray’s. They were grossing over a million dollars annually by 1958. Little known today is that Dreicer gave at least 242 other restaurants Silver Butter Knife Awards, including three others in Minneapolis: Charlie’s Café Excepionale, Hotel Nicollet, and Doust’s. Murray’s seized the opportunity to capitalize on the distinction, essentially making the name their own in the minds of modern diners. Although other Minneapolis restaurants earned a Silver Butter Knife, Murray’s holds the distinction of being the only Minneapolis restaurant to also receive the Gold Butter Knife Award, a step up in Dreicer’s hierarchy of steak greatness. It is likely that the Murrays stuck with promotion of their Silver winner due to its simpler marketing message—the Silver 28 ounce strip sirloin was better suited for a couple to enjoy than the double porterhouse (over four pounds) that received Gold honors. Since the Dreicer awards, Murray’s has received countless other awards for their excellence in food. Today the Murray’s building is dwarfed by its neighbors, and it’s a miracle that the building still stands, given that redevelopment in Downtown Minneapolis has favored swallowing up the smaller, older buildings and replacing them with taller and wider buildings that often take up a half-block or more. Sixth Street was no exception, and when Murray’s opened in 1946, it was surrounded by many other smaller buildings that had first floor storefronts. The Plymouth Building, neighbor to the northwest, has also been a source of development pressure for the Murray’s building since it was completed in 1910. The 13-story Plymouth replaced a row of buildings along Hennepin Avenue and 6th Street South. In 1927, the Plymouth Building was looking to do a 25-story addition after Minneapolis height limits were revised upwards. The renovation did not begin prior to the stock market crash and Great Depression, which wiped out most construction plans for taller buildings in Minneapolis that were not underway before October 1929. Another great threat to the Murray’s building has been the demand for parking. As early as the 1940s, the Minneapolis Chamber of Commerce identified the north side of 6th Street as a desirable location for a parking ramp. This vision came to fruition in 1967 when the adjacent buildings just to the southeast of Murray’s were torn down for a parking facility. One of the victims of the demolition was John’s Place, a beloved Chinese restaurant that was located at 28 South 6th Street for more than 59 years. The most serious threat to the Murray’s building occurred in 1998 and once again involved creating additional space for parking Downtown. In the summer of 1998, the Murray family signed a letter of intent to sell its site to the developer of the new office tower at 50 South 6th Street. The Murray’s plan was to move into the larger first-floor space. The existing Murray’s building was intended to be torn down to allow for parking for the new skyscraper. Luckily for the Murray’s building (and signs), seven months after signing a letter of intent the plans fell through when the parties could not agree on terms. The Murray’s building also faced a freakish threat from the demolition of the Dyckman Hotel directly across the street in 1979. That year, the 10-story hotel was imploded to clear a path for the 52-story City Center, which was completed in 1983. When detonated, tons of debris was meant to fall into a pile inward—instead, some fell onto 6th Street. When the wrecking company was preparing the building for demolition, they did not account for all of the building’s steel columns. As the Minneapolis Tribune described it, “When the explosives were set off, the steel columns caused part of the hotel wall to fall outward, which was not supposed to happen.” Luckily for the Murray’s and Plymouth Buildings, the only damage was a broken window at Plymouth Optical. The building at 24-26 6th Street South has been a hotel, ballroom, saloon, shoe store, and other restaurants. Among the establishments that called the space home prior to Murray’s include the Hankow Café which was located on the second and third floors, and claimed to be “the finest and largest Oriental Café in the Northwest.” Surely the establishment was less proud of the fact that the Hankow Café kitchen was the site of a murder. The head cook, Woo Back Sing, was killed by Charley Chin Fong. The incident was the result of a quarrel between the two that dated back to when they were acquainted in China. Chin Fong tried to escape by boarding the Rock Island train in Saint Paul and heading south. Minneapolis detectives worked with their Iowa counterparts to arrest Mr. Chin Fong and bring him back to Minneapolis for trial. Successors of Hankow Café at 26 South 6th Street include the Winter Garden Ballroom and Delayney’s Bar. The Delayney’s name lives on at Murray’s today; when the restaurant’s bar area was renovated in 2012, a decorative terrazzo and ceramic tile floor was found on which “Delayney’s” is spelled out in contrasting tiles. The Murray’s first restaurant, Red Feather Cafe was not located in Downtown Minneapolis, but at 2209 West Broadway Avenue, and opened on August 10, 1935. The Murrays lived only a block away at 2321 Queen Avenue North. The one-story commercial building was torn down in 2011 after receiving major damage from the tornado that struck North Minneapolis. However, the house still remains in good condition. The Red Feather quickly gained a reputation for serving good food and by 1939 business was so good that they decided to move downtown. The Murrays opened in their new location at the Russell Hotel (18 South 4th Street) but branded it Murray’s Red Feather Bar and Café. Six years after moving to the Russell Hotel, Art and Marie decided to purchase the building at 26 South 6th Street and opened Murray’s Restaurant and Cocktail Lounge on August 5, 1946. Art and Marie Murray could be thought of as the Charles and Ray Eames of the Minneapolis food scene, each contributing to the success of their endeavors. Any story of Murray’s of Minneapolis must include both Art and Marie, because it is a story of a husband-and-wife team that brought many kinds of success to the restaurant that bears their name. Both contribute from their special talents daily, and both are greeted by guests by their first name. Marie was in charge of food service and created the seasoning for the Silver Butter Knife steak and developed the recipes for the house salad and garlic toast. By the 1960s, Art and Marie’s son Patrick was helping run the restaurant. He worked his way up from bus boy to owner and admits that he never had a job outside of Murray’s at any point in his life. Today, a third generation of Murrays—Tim, Jill and James—are at the helm. It is an amazing feat for a family-owned restaurant to be open for almost 80 years; 66 of those years at the 6th Street South location. According to the Restaurant Brokers, the number of age-old, family-run eateries that stay in business for more than 50 years represent .01 percent of all restaurants. This makes the survival of the restaurant, and its signs, even more impressive. What is Murray’s secret to success? The Restaurant Brokers credit simple and delicious food as key to restaurant longevity. In addition, consistency with serving great food, creative advertising, invested staff, tradition, and attention to detail have also helped. Thank you to the James K. Hosmer Special Collections at the Minneapolis Central Hennepin County Library, Minnesota Historical Society, Northwestern Architectural Archives, University of Libraries, University of Minnesota, and Preservation Design Works for their assistance. Images from the Northwestern Architectural Archives may not be reproduced nor redistributed without permission of the Northwest Architectural Archives. Images from NAA are from the Larson and McLaren Papers (N69).